← The Grimke Sisters. And Zombies. Unexpected, but we’ll take it. “We’re trying to find our way in,” we responded. The young man flashed a killer smile. “Follow me!” Of course! He took us through the basement doors and to an equally nice guard, who did the security thing, then pointed us to an elevator that would take us to the second floor. On the second floor is Charleston’s council chamber, the second oldest chamber in continuous use in the US (NYC has the oldest) and a public museum. It became a de facto art gallery when they started commissioning portraits of famous visitors to the city and hanging them (the portraits, not the people) there. The most famous of the famous visitors was George Washington. In 1792, the year after GW’s Charleston visit, the city commissioned John Trumbull, noted for his paintings of Revolutionary War scenes, for a portrait of GW. The result was “General George Washington at Trenton,” depicting Washington during the Revolution, on the night after the second Battle of Trenton. Trumbull considered it his best work ever, but the Charleston fathers weren’t happy with it. Some stories say that they wanted Charleston to figure into the picture somehow. Yale University, which owns the Trenton painting, says that the city wanted “a more amiable and peaceful image.” Whatever the reason, Charleston rejected it and Trumbull painted them a different picture, of an older George Washington and his horse with Charleston behind them. But that’s not the end — or the most interesting part — of the story. 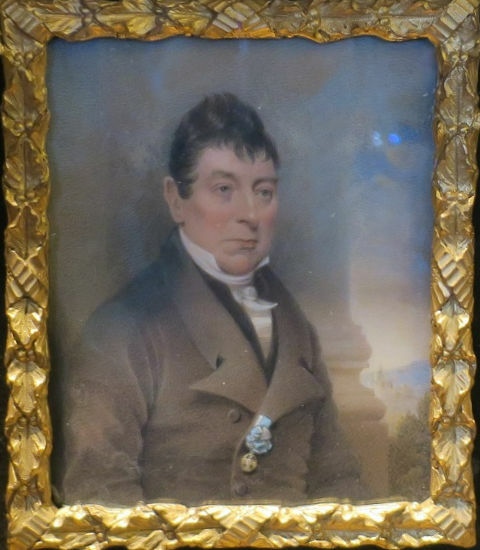 Trumbull had an ego and was not happy that Charleston had rejected his first portrait. So in his second, he has GW’s horse lifting his tail, with the skyline of Charleston positioned strategically beneath it. Apparently the Charleston city fathers didn’t notice that part of the painting, or they didn’t care. They accepted it. It’s very Charleston that the portrait now has pride of place, front and center of the council chamber. Another famous visitor hanging on the city hall wall: America’s Favorite Fighting Frenchman – Lafayette! He made a grand tour of all 24 states in the United States starting in 1824 and, on March 13, 1825, landed in Charleston. His visit was commemorated with this 1825 watercolor by Charles Fraser. Sadly, no fun story behind the portrait (that I’m aware of). There is, however, a fun story behind the picture below. A full-length portrait (1665-1714) of Queen Anne, by Sir Godfrey Kneller, hung in the Commons House of Assembly in Charleston until the Revolution. After the war, it was put into storage and left to rot. Which it did. I don’t remember when it was discovered again but it must have been long after the War of 1812, when a rendering involving a British monarch was once again desirable. 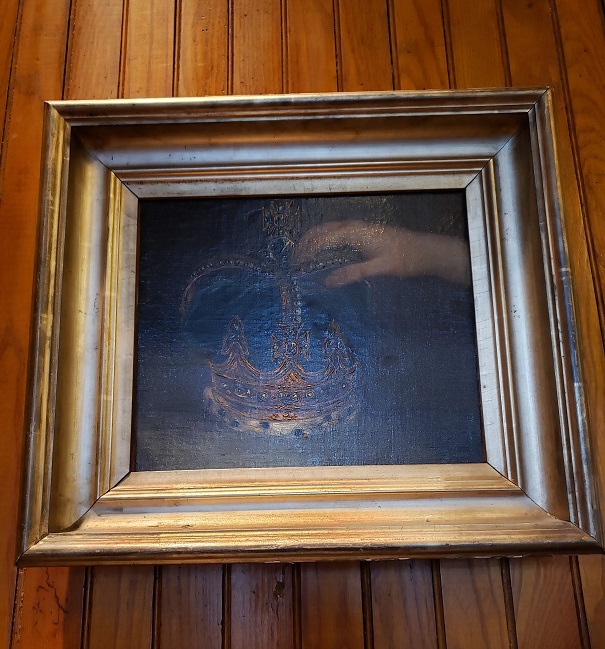 By then, the only part of the portrait that was salvageable was a portion with Anne’s hand touching a crown. So they cut that piece out, framed it, and hung it. I know this is a terrible photo, but I wanted to tell you that story because, like the Trumbull painting, I think it’s very Charleston. There’s a lot more going on in the chamber, including 1818 black walnut councilors’ desks, 1850 chandeliers, and 1896 Edison light bulbs that line the tin ceilings (all seen in the first photo in this post). And many, many, many portraits of Charleston mayors. We roamed the room on our own, but there was a staffer there to answer questions. 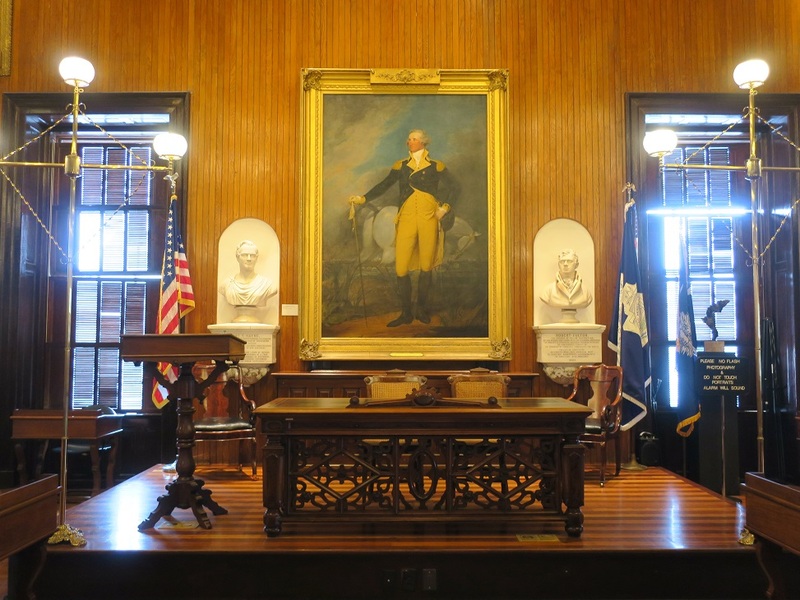 The building was constructed in 1801 as a First Bank of the United States (not the first bank in the US, which was in Philadelphia) and became Charleston’s city hall in 1818. 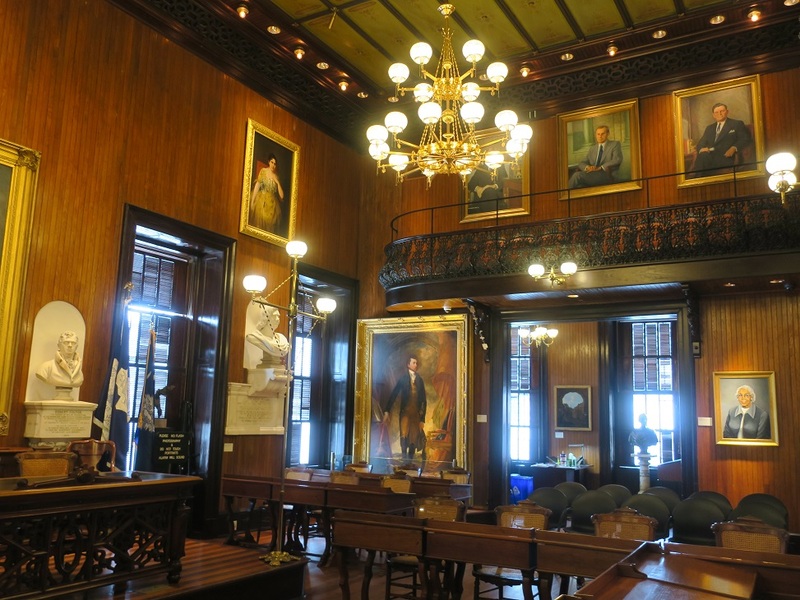 If you hadn’t considered visiting the city hall when you’re in Charleston, you should. 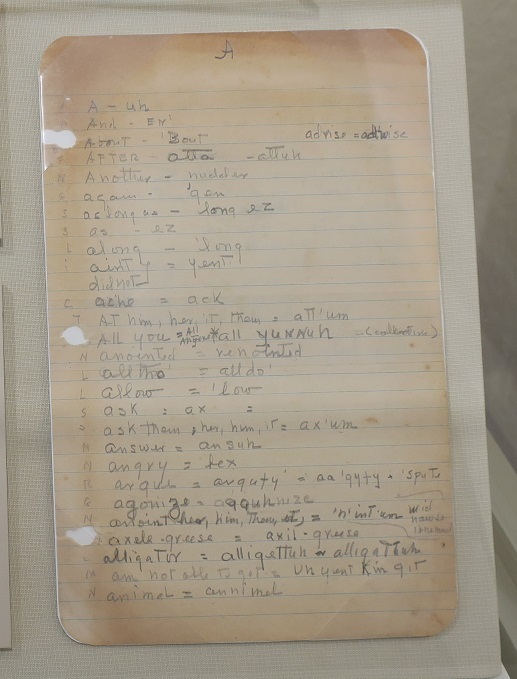 Gallery | This entry was posted in South Carolina and tagged Charleston City Hall, Gullah, John Trumbull. Bookmark the permalink. 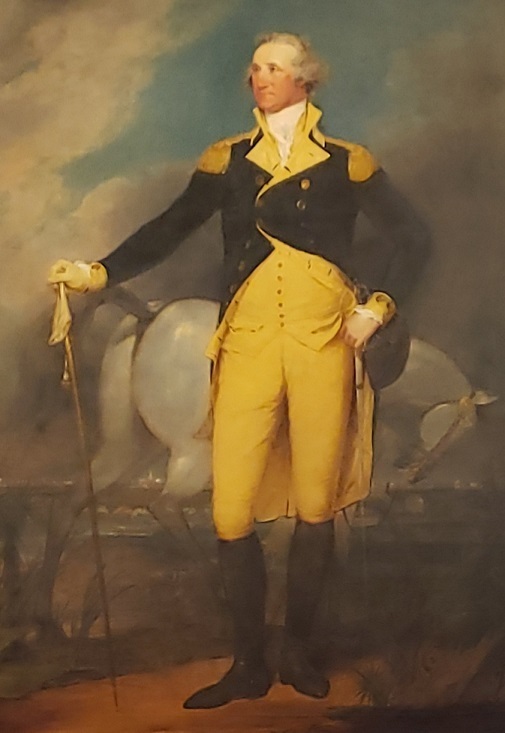 I chuckled at your comments of the little feud going on regarding George Washington’s portrait with his horse. Although I’m familiar with the scene, I never noticed the lifted tail metaphor! Actually, Washington’s figure is dominant, so that’s where the eye is drawn. I love that story. And it makes the painting so much more interesting than the usual.